Planet Internet Marketing Ltd, provider of cutting edge and powerfully effective monetisation strategies for internet marketers, entrepreneurs, SMEs and ‘blue-chip’ companies, announced today that it will host a free webinar with one of the leading UK based Facebook Experts, Kavit Haria, designed to help internet entrepreneurs and businesses enhance their revenue and maximise their profitability. 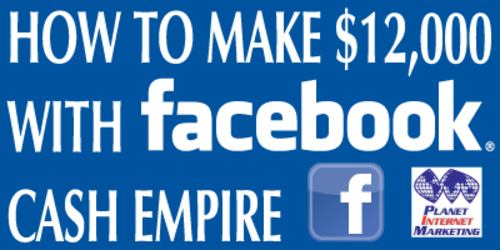 The webinar, entitled “Dead Broke To $12,000 Per Month Using Facebook Cash Empire”, will be held on Tuesday, May 17 at 8pm BST-British ***Summer*** Time. Click here now to register, it's completely free.